Unlock your QuirkPower with the Superhero Quiz! Stop hiding your gifts. Reveal how powerful you are in this free Superhero Quiz! Diving deeper into knowing yourself will help you to feel more comfortable in your own skin and see more of the fullness of who you truly are. --> as well as what to watch out for... your kryptonite! When you are aware of your strengths and weaknesses, then you can enhance what you're already great at and understand what might hold you back from making a positive impact in the world. 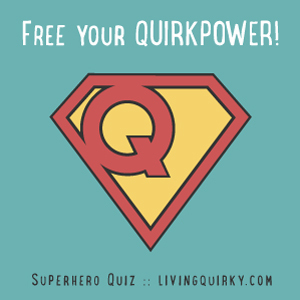 Take the free quiz below to discover your superhero and unlock your QuirkPower! When answering the questions, keep in mind there are no wrong answers! Go with your gut, your first response, and most importantly have FUN! To take the quiz, click on one of the answers below and you'll be taken to the next question. There are only 9 questions and then you pop in your email address so I can send you the full Superhero QuirkPower Guide! This way you can read through your results anytime you want and even read about all of the other superheroes. Plus, at the end of the guide, there's a bonus section that you definitely don't want to miss with a special surprise! Onwards to unlock your QuirkPower! . . .
Beauty is everywhere, even in the darkest shadows. For even the wise cannot see all ends. I'll quit when I reach the grave.